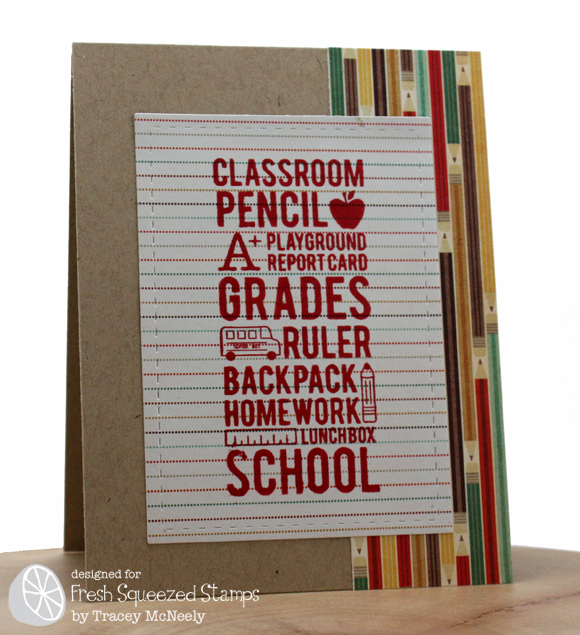 It is my day at the Fresh Squeezed Stamps blog today and I am sharing a Back to School card with a bit of a masculine theme. My oldest is heading to University at the end of the month and I wanted to pop something into his bag that wasn't too juvenile but lets him know that I am thinking about him and his journey ahead. I created a clean and simple card using papers from Fancy Pants Off to School combined with this fantastic Subway Series stamp. Perfect for Ben. I am sure he will love it. What a fun card Tracey. Love that sentiment with the sweet little images. Love this Tracey and so will he!!! 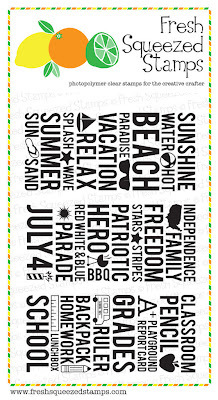 those stamps are too fun.. i love your card.. This is so great! It gets an A+ from me! LOL! This is so great. You know that Ben will be so happy you like to make cards, because he will always get a little bit of love from afar. This is perfect for school, and I just love it in red. I love it! It's just enough for a "young" man who is growing up! Your son will love this! Great back to school card--love the papers! Great masculine back 2 school card! Makes me want to have a little one back in school, not really but this card is just too cute.